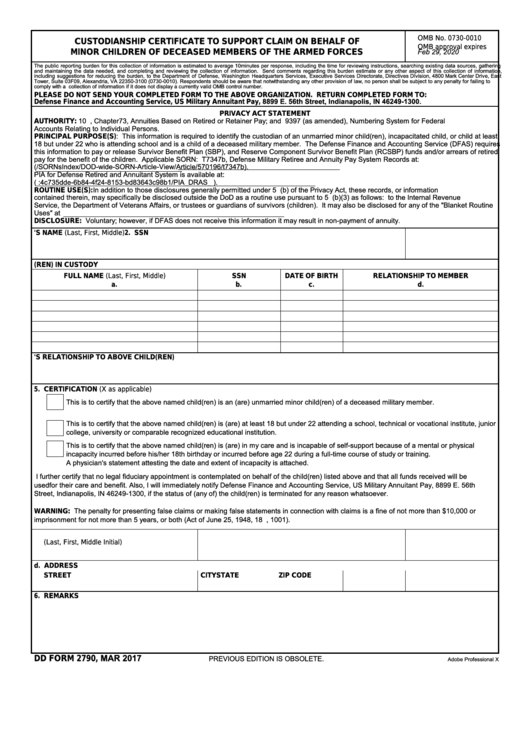 Download a blank fillable Dd Form 2790 - Custodianship Certificate To Support Claim On Behalf Of Minor Children Of Deceased Members Of The Armed Forces in PDF format just by clicking the "DOWNLOAD PDF" button. Complete Dd Form 2790 - Custodianship Certificate To Support Claim On Behalf Of Minor Children Of Deceased Members Of The Armed Forces with your personal data - all interactive fields are highlighted in places where you should type, access drop-down lists or select multiple-choice options. comply with a collection of information if it does not display a currently valid OMB control number. Accounts Relating to Individual Persons. DISCLOSURE: Voluntary; however, if DFAS does not receive this information it may result in non-payment of annuity. This is to certify that the above named child(ren) is an (are) unmarried minor child(ren) of a deceased military member. college, university or comparable recognized educational institution. incapacity incurred before his/her 18th birthday or incurred before age 22 during a full-time course of study or training. A physician's statement attesting the date and extent of incapacity is attached. Street, Indianapolis, IN 46249-1300, if the status of (any of) the child(ren) is terminated for any reason whatsoever. imprisonment for not more than 5 years, or both (Act of June 25, 1948, 18 U.S.C. 287, 1001).